The Alexa Skills Kit supports authorization code grants for account linking in custom, smart home, video, meetings, and music skills. In this grant type, the authorization server provides an authorization code (code) after the user authenticates with the service. Alexa then uses this code to request an access token / refresh token pair from the authorization server. Alexa can then use the refresh token to request a new access token after the old access token expires. For a skill with a custom model, see Account Linking for Custom Skills. For a skill with the smart home, video, meetings, or music pre-built model, see Account Linking for Smart Home and Other Domains. The Alexa app displays a login page within the app, using an authorization URI you provide when you configure account linking. This login page lets the user authenticate with the authorization server. Once the user is authenticated, the authorization server generates an authorization code (code). The authorization server redirects the user to the Amazon-provided redirect_uri and passes along the state and code in the URL query string parameters. 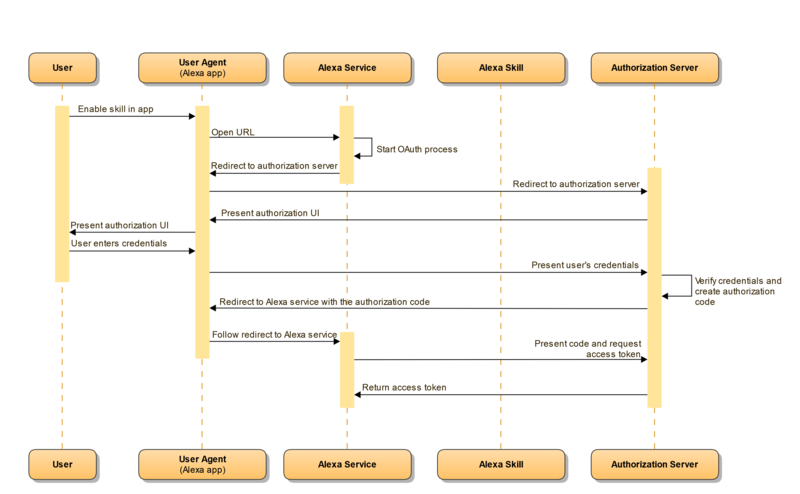 The Alexa service uses the code to request an access token / refresh token pair from the authorization server's access token URI. Note that the authorization server must respond to the token request within 4.5 seconds. Alexa saves the access token and refresh token. The user's Alexa account is now linked to the account in the other service, and the skill is ready for use. When the user makes requests to the skill, each request (such as an IntentRequest for a custom skill or a TurnOn directive for a smart home skill) now includes the access token (access_token). Your skill uses this token to get the information you need from the resource server. If the access_token is expired, Alexa calls the access token URI again with the refresh token to request a new access token / refresh token pair. The authorization server must be able to accept the required parameters, authenticate the user, generate an authorization code, then redirect the user to the Amazon-provided redirect_uri. The access token URI must accept client credentials and the authorization code and return an access_token (and optionally, a refresh_token that can be used to get a new access_token in the future) for the user. Configure your skill for authorization code grant in the developer portal. See Configure Account Linking in the Developer Console for details. When a user starts the process of linking accounts, the Alexa app displays a login page for the authorization server. The authorization server needs to validate the user's credentials and then return a code, which Alexa then exchanges for an access token. You specify the URL for this login page in the developer console on the Build > Account Linking page. You provide the URL for the login page in the Authorization URI field. You provide the URI of the server that can exchange the code for the access token in the Access Token URI field. If you use a third-party OAuth provider, see the documentation for that provider to determine the authorization URI you need when you configure account linking. Look for the URI for an authorization request and access token request. Indicates the type of response that should be returned after the user has been authenticated by the other service. This is always code for authorization code grant. It must generate an authorization code that can be passed to your authorization server to retrieve an access token that uniquely identifies the user in the resource server. Include the state and code in the URL query string. Note that the parameters are passed in the URL query string. The Alexa service calls the access token endpoint for your authorization server (specified as the Access Token URI in the developer console) and passes the code and client credentials. The authorization server must return the access token and an optional refresh token. The authorization server must respond to the token request within 4.5 seconds. Access tokens must have a lifetime of at least 6 minutes. This means the expires_in parameter of your access token response must be greater or equal to 360. The authorization server should not immediately invalidate previously used refresh tokens if a new refresh token is generated after each use. In addition to possibly causing outages in highly distributed and concurrent systems such as Alexa, this also tends to leave the user in a state from which the only recovery is to disable, enable, and account link the skill again from the Alexa App. The best practice is either to have refresh tokens that do not expire, or for refresh tokens that do expire, to keep X number of old refresh tokens valid, and only invalidate them if the authorization server has confirmed that the most recent refresh token was successfully received by Alexa and used to obtain a new access token. Important: When Alexa uses the refresh token to retrieve a new access token for an existing user, Alexa uses the access token URI that was configured at the time the user linked their account. Therefore, if you change the access token URI later, users who linked their accounts before continue to use the old URI for retrieving updated tokens. The users must unlink and re-link accounts to switch to the new access token URI. Therefore, if you change your OAuth configuration after you publish your skill, be sure to keep your old access token URI in service until your existing user base has moved to the new URI. The OAuth 2.0 authorization grant to use to obtain the access token. Select Auth Code Grant. For smart home and video skills, this is automatically selected, as this is the only supported grant type. The URI for the access token endpoint for your authorization server. The Alexa service calls this URI to exchange the authorization code for an access token. Alexa also calls this URI with the refresh token to get a new access token when the previous token expires. For a third-party OAuth provider, look for the URI provided for access token requests. For example, for Login with Amazon, the URI for the access token request is https://api.amazon.com/auth/o2/token. Refer back to Access and Refresh Tokens for token requirements and details. The Client Id is also part of the client credentials that the Alexa service includes when requesting an access token from the Access Token URI. A credential you provide that lets the Alexa service authenticate with the Access Token URI. This is combined with the Client ID to identify the request as coming from Alexa. For a third-party OAuth provider, look for the client identifier that the provider expects. For example, for Login with Amazon, the client secret is created when you create a security profile for Login with Amazon. Identifies the type of authentication Alexa should use when requesting tokens from the Access Token URI. The time in seconds for which the access token is valid. This value is used if the OAuth client does not return expires_in. If the OAuth client returns expires_in, the value provided by the OAuth client is used instead.